Our Heritage Fleet Program is designed to preserve and celebrate our history. The program was created to ensure that our vintage buses, rail cars and other equipment are preserved and maintained so they can be remembered and enjoyed through charters and events held for the public. This program, established in 2016, is modeled after similar programs at other transit agencies and will establish guidelines and protocols for future preservation, maintenance and repair efforts for the current Heritage Fleet and those vehicles which may join it in the future. Funding for the program comes from revenue generated by CTAgifts.com (our online gift shop) and private charters. Repair and upkeep of the vehicles is provided through the generous volunteer work of CTA employees, retirees, and industry experts. Transit services by our predecessors date back to the late 1850s, with the first horse-drawn streetcar service operating south on State Street from downtown. Since those days, local transit in Chicago has been provided through a variety of cable cars, electric streetcars, elevated railways and subways and many types of buses, all of which have been a part of the important role transit has played in the Chicago and its region's development, by linking people, jobs and communities. The CTA you ride today is an independent government agency incorporated by the State of Illinois. The first services operated under the CTA name ran in October 1947 when we acquired the then-private Chicago Rapid Transit Company (elevated and subway lines—the 'L' system) and the Chicago Surface Lines (who ran streetcars and buses), followed later by the acquisition of the Chicago Motor Coach company (buses). This consolidation formed one, unified public transit system whose services became complementary to each other. In fact, many of the services we provide today are descendants or evolutions of those once provided by these three companies, around which the city and its many neighborhoods grew. Today we operate a fleet of over 3,300 rail cars and buses which operate over 1,500 miles of bus and 'L' routes. On a typical weekday, our modern fleet travels about 380,000 miles, providing roughly 1.6 million rides to the people of Chicago and 35 neighboring communities. We provide these services today with over a century of our own experience and that of our predecessors, and take pride in the rich history that has led us to where we are today. Two 1923 4000-series rail cars, featuring the orange-and-brown paint scheme they wore in the 1940s and adorned with reproduction advertisements from the era. Four 1950s 6000-series rail cars, two featuring their original Mercury Green, Croyden Cream, and Swamp Holly Orange paint scheme and adorned with reproduction advertisements from the era and two in their later "Spirit of Chicago" paint scheme. An eight-car train of 2400-series rail cars, produced from 1976-1978 and featuring their restored red-white-and-blue exterior markings. Three buses from the 1960s, all featuring their original markings. These cars, numbered, 4271 and 4272 which CTA keeps for historic preservation, were built in 1923 and ran on the 'L' for 50 years! They were of the 4000-series of railcars and built by the Cincinnati Car Co., jointly purchased by the 'L' companies of the day to upgrade their various fleets (the first 4000s came in 1914 and between the two orders, around 450 were in service by the late 1920s). In a contrast from our current fleet of more modern, higher-performance railcars (especially the new 5000-series that's being integrated into the fleet), these cars came with no computer chips, no A/C, incandescent lights (which would flicker when you'd go through a junction) and had relatively simple electric motors and mechanical, compressed-air braking systems. The group of 4000s built in 1922-24 also had trolley poles mounted on top so they could run in areas where we had overhead trolley wires instead of third rail, such as in Evanston. In some ways, many of the functional attributes of these cars were not much different than that of the earliest 'L' cars and electric streetcars in Chicago. One improvement these cars had over their predecessors was added safety--these came with a body of steel where older cars were made of wood. These also features more common of rapid transit cars of their era—wooden interior floors, cushioned plush seats, and electrically-controlled pocket doors (like cars have today). The cars were outfitted with sash windows passengers could open for air, a collapsible cab the motorman would operate from, and originally had plush seats (later replaced with cushioned vinyl). Initially, these cars would have a conductor who would stand outside, between each car and open the doors immediately adjacent him at every stop—rain or shine or blizzard. Later, the cars were upgraded to allow for all the doors to be open from one place, but conductors still generally did this from outside the cars. While today's cars can easily reach our systemwide speed limit of 55mph (and frequently do on many of our lines), these cars tended to max out around 45mph and had a completely different feel and sound—but one we find warm and charming on the special occasions we start these cars up, today. The last were retired in 1973 and these are the only two maintained by CTA, today. Railcars 6101-6102 were built by the St. Louis Car Company as part of the CTA’s first order of 130 cars of the 6000-series, numbered 6001-6130. Subsequent orders brought the fleet size up to 720 cars. The 6000-series represented a total departure in rapid transit car design for Chicago. The older and heavier wood and steel car designs of the 1890s-1920s gave way to lightweight cars whose all-electric propulsion and braking utilizing technology first developed for PCC streetcars by the Electric Railway Presidents' Conference Committee (PCC) in the 1930s. Unlike earlier cars, they were permanently coupled in pairs (“married pairs”) with only one motor cab facing outward from each car. Dual-paneled folding “blinker” doors were placed along the sides of each unit instead of at the ends for more efficient movement in and out of the cars; seats were permanently fixed facing opposite ends from the middle. Cars 6001-6200 originally required the conductor to stand between cars to operate the doors, but the door controls were subsequently relocated inside the cars. The first 200 cars, including 6101-6102, were the beginning of a modernization process intended to remove from service the remaining turn-of-the century wooden units still in use. Beginning with car 6201, the remaining 6000-series cars—including 6711-6712—were built using motors, trucks, controls, and body components salvaged from PCC streetcars, which were relatively new but being phased out by CTA in favor of buses. The 6000-series made up the majority of the CTA ‘L’ fleet for many years, but began to be slowly retired in the late 1970s. By 1981, 6101-6102 were the last 6000s with their original dual-headlight configuration (starting with car 6200, the design had been changed to a single headlight, and all other earlier cars so modified). Largely out of passenger service and consigned to work train service by 1990, 6101-6102 were kept as historical vehicles, making occasional appearances at various events. Car 6711 is an especially special addition to our collection: Though briefly experimented-with earlier, air conditioning would not become a standard feature until our 2000-series was delivered in 1964. Upon the arrival of the 2000s, a sample air conditioning unit using the same equipment as on the 2000s was installed in car 6711 to determine the cost and effectiveness of retrofitting the 6000s for A/C. Though not pursued because of the high cost and extended downtime for installation, the air conditioner in this car remained in service for some time and elements of this unusual modification remain visible inside the car! Over the years the 6000s featured a variety of paint schemes: from the original Mercury Green, Croyden Cream, and Swamp Holly Orange they were delivered in (featured on cars 6101-6102), to the Mint Green and Alpine White they wore from the mid-1960s to the mid-1980s , to a Bicentennial scheme, and then to a “Spirit of Chicago” livery seen on 6711-12, as seen 6711 at its delivery back to CTA. The 6000s ran for more than 40 years, and at their widest usage comprised approximately two-thirds of the entire ‘L’ fleet, making them the quintessential ‘L’ car for many Chicagoans. Cars 6101-6102 ran in service on the final run of the 6000-series on December 4, 1992, after which the last of the series was retired from passenger service. In 1994, they were sold to the Fox River Trolley Museum, who preserved the cars for 23 years. 6711-6712 spent their retirement at The National Museum of Transportation near St. Louis. 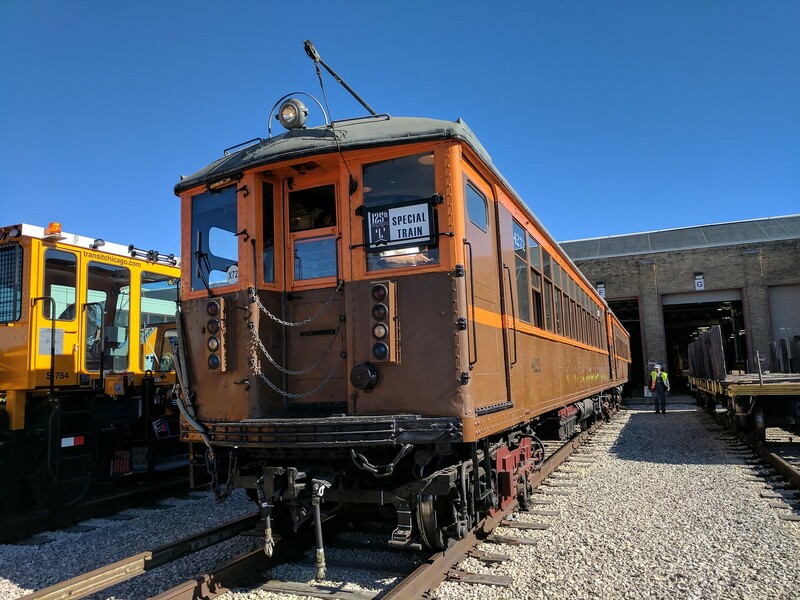 In 2017, the museums sold these two pairs of cars back to CTA to be added to the Authority’s Heritage Fleet program. The first of this series of railcars were introduced in 1976—a year where the nation was celebrating its 200th birthday. The 200 cars in this series were built by Boeing-Vertol between 1976-1978, with the car’s interior and exterior designs done by industrial design firm Sundberg-Ferar, who also worked on cars for the Washington Metropolitan Area Transit Authority (WMATA, DC Metro), Bay Area Rapid Transit (BART) and Metropolitan Atlanta Rapid Transit Authority (MARTA). The cars were delivered with bold, red-white-and-blue graphics on both the sides and the end of the cars—a nod to the nation’s bicentennial—and were initially introduced into Ravenswood Service (today’s Brown Line) and North-South Route (roughly today’s North Side Red Line and South Side Green Line, connected into one route via the State Street Subway), and West-Northwest Route (today’s Blue Line, with most of today's Pink Line as a subsidiary branch off the west portion). While the last 2400s ended their service on the Orange and Brown Lines, they were most associated with Green and Purple Line services from the 1990s until near the end of their service. Though no longer in passenger service, we also retain two dozen 2400-series cars that were modified to serve as maintenance/work trains (you may recognize 2400s designated for work service by their reflective red-and-white candy striping, lending them greater visibility if parked on the tracks at night). The CTA Heritage Fleet includes three buses that were built in the 1960s. The 8499 bus is a one of a kind prototype; Purpose was to serve as a “tester” for new features, including updated designs and new types of engines. Bus was featured in music video for “The Game of Love” by Carlos Santana (ft. Michelle Branch), which was filmed in Chicago. This bus represented transition between “old look” body style used on hundreds of CTA buses in the 1950’s and more streamlined “New Look” style used on most buses built by GMC and Flxible during the 1960’s and 1970’s. Part of a large order of “New Look” buses ordered in the 1960s and ‘70s. The order that included bus 301 replaced buses built in the 1940s. The color scheme was originally all dark green; light yellow was added later to the upper body. This bus was built 6 inches narrower specifically for the #16 Lake route. Due to the columns of the ‘L’ structure above Lake Street being located in the street west of Rockwell, unusually narrow buses were needed to provide sufficient clearance for buses to safely pass one another there. Part of a large order of “New Look” buses ordered in the 1960s and ‘70s. The order that included bus 3706 replaced buses built in the 1940s.